If you already have your operating authority, your trucking company is good to go, right? Not quite. If you’ve been in the trucking industry for a while as an owner operator or the owner of your own company and you have a USDOT number, you are required by the FMCSA to participate in the biennial update. Here’s a brief overview of what the biennial update is and why it’s important. What Is the Biennial Update? The biennial update is a requirement set by the FMCSA to update your MCS-150 Form (also called the Motor Carrier Identification Report) every two years, keep in mind some states actually require you to update it every year as part of renewing your truck/fleet registration. You are required to update the form even if no business information has changed. If you don’t update your MCS-150 form, your USDOT number will be deactivated and you could be faced with a $1,000 fee per day up to $10,000. Note: You will be charged this fee even if none of your business information has changed within the past two years. It is rare to see such a hefty fine, but the FMCSA commonly deactivates USDOT numbers that do not do the update, which can cause you to be placed out of service, forcing your trucks to be parked. When Is the MCS-150 Submission Deadline? The deadline to submit your updated MCS-150 varies based on the last two digits of your USDOT Number. The year you are required to update the form is based on the second to last number of your USDOT number. If the number is odd: You file your biennial update every odd-numbered year. If the number is even: You file your biennial update every even-numbered year. How Do You Update Your MCS-150? Don’t get fined or have your trucks get stopped for not updating your MCS-150 Form! The easiest way to do the update is to let Progressive Reporting take the stress out of it by letting us take care of it for you. Give us a call today at (866) 736-6507 to see how we can help your company stay compliant with the FMCSA. Once we’ve completed the form, we’ll provide you a copy of the form for your records. What Do You Need to Update the MCS-150 Form? If you don’t have your PIN number, we can get it for you. When Do I Have to Update the MCS-150? 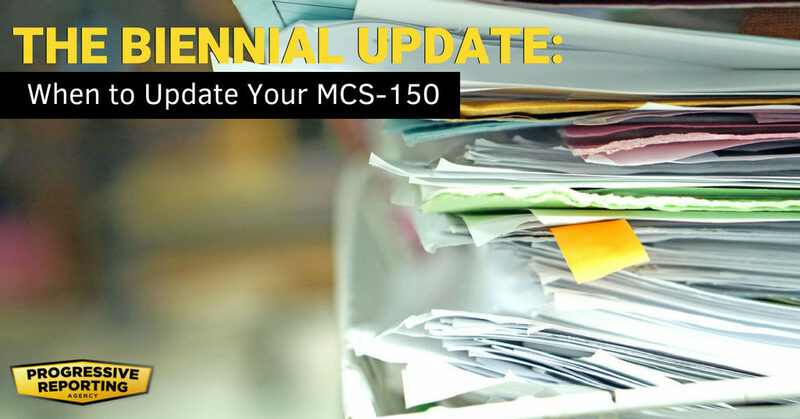 You are required to update your MCS-150 form any time you change any of your business information listed on the form even if you are not due for a biennial update. The FMCSA uses this form to make sure that information about your company is accurate and the correct safety rating in their Compliance, Safety, and Accountability (CSA) program. If you have more questions about the biennial update or updating the MCS-150, give us a call! We’re happy to answer any questions you may have about updating your MCS-150 and the biennial update.